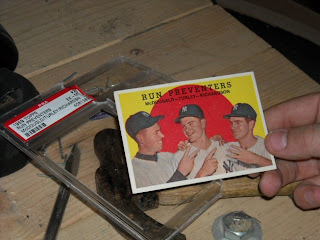 Last Sunday I described how to crack open a GAI graded card by opening a 1961 Topps of Larry and Norm Sherry. The next day, I sent that card off to Norm Sherry. I received that card back signed today, just 5 days after I mailed it. Mr. Sherry also signed a 1962 Topps for me. He also wrote me a short note describing the minor league managing jobs he had, in response to the questions in my letter. I finally got some things hung on the walls in the basement. There's still a hole and some stains in the ceiling where the water line broke, but I'll deal with that later. 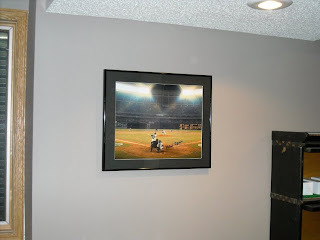 I hung the three Metrodome banners along one wall. These banners include Michael Cuddyer, Francisco Liriano and Mike Redmond. I also hung my Hank Aaron photo next to my desk. There's still a lot of work to do including putting all my 1987 Bobbleheads back into their display case, putting the 1965 Twins items back into a display case, and hanging many, many Twins 8x10s on the wall. I also have a lot of old, signed magazines that I need to figure out where to put. 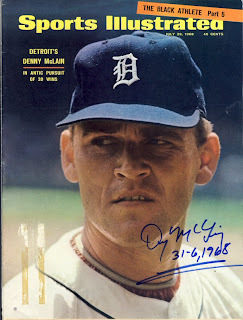 Today in the mail I received a Sports Illustrated from 1968 signed by Denny McLain. As you'll recall, Mr. McLain won 31 games in 1968 for the Detroit Tigers. I had him sign a Sports Illustrated poster at Bud's Sports Cards back in October. This event was a a fund raiser for Lee High School in Wyoming, Michigan. A fellow member over at sportsgraphing.com arranged to take items to the event and send them back to everyone. The fee was only $5. The magazine has pretty nasty label marks, but for only $5 to have it signed, I'm happy with it. On Monday I mailed off nine requests, and 2 more yesterday, including another Whitey Ford card. 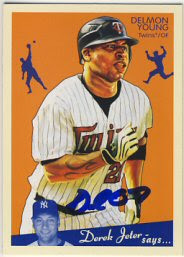 This time, a 2008 Goudey. Hopefully, I'll have better luck this time. I didn't include a penny sleeve or any other type of case with the card. I also sent it to his Florida address instead of the New York address listed on his web site. I think this will result in a much quicker return. Tomorrow I am mailing a 1949 Bowman to Eddie Bockman. 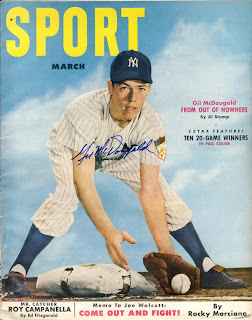 Today in the mail I received the 1952 Sport Magazine that I sent to Gil McDougald. He signed it nicely with the blue sharpie I included and he even returned the pen. I hadn't counted on that, and it looks like my return postage was 1 cent short. Hopefully that didn't inconvenience Mr. McDougald. I included $10 with my request. 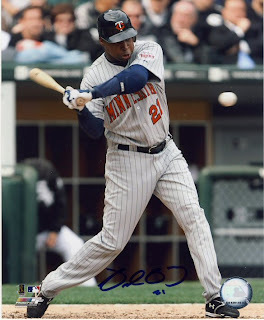 I also received a Zoilo Versalles signed picture that I bought on eBay. Mr. Versalles was voted the American League MVP in 1965 when the Twins went to (and lost) their first World Series. The Cuban-born player has an unusual first name. 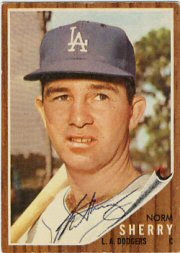 In fact, Topps misprinted his name on his 1961 baseball card as "Zorro". Nice. At the same time my son and I cracked open a PSA graded card, we also cracked open a Global Authentication, Inc. (GAI) graded card. The GAI graded card was not as easy as the PSA card, but still easier than the Beckett Vintage Grading (BVG) card we cracked open. 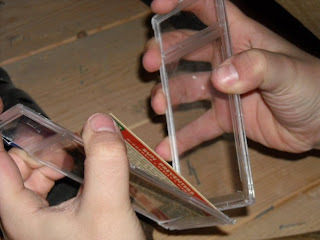 The reason the GAI card was a little more difficult than the PSA card was because the two pieces of the slab do not come together on the edge of the slab, like the PSA and BVG cards. It seems that the back piece of the GAI slab fits inside the front piece. The front piece of the slab wraps around the back piece, which is recessed within the front piece. If you look closely at one, you'll see what I mean. 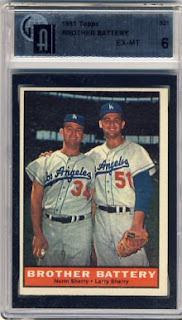 We started with a 1961 Topps Brother Battery, #521, featuring Norm and Larry Sherry. Unfortunately, Larry passed away in 2006. 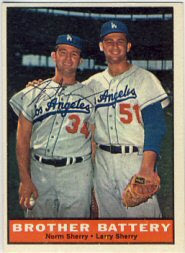 I plan on sending this card to Norm, to add to my 1961 Topps set collection. One thing we noticed is that the plastic seemed a bit more brittle on the GAI slab and tended to fly apart more than the other slabs. I'm not sure if this was a difference in plastic, or the way we had to crack it open due to its design. Be careful and be sure to wear eye protection to avoid injury. Since the front of the slab wraps around the back piece, the seam between the two pieces is on the back of the slab. In the close-up picture below, the chisel is placed along the seam. 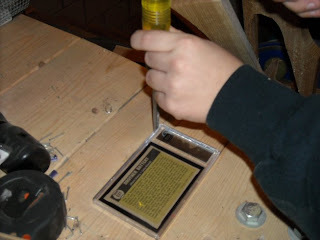 Just like we did with the PSA and BVG slabs, we placed the chisel along the seam and lightly tapped it with a hammer. This results in breaking away the front piece of the slab that wraps around the back piece. 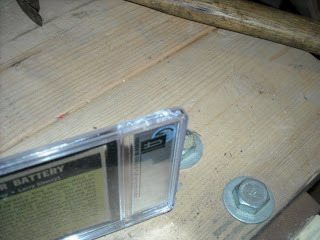 This missing piece then exposes a seam between the two pieces on the side of the slab much like the PSA and BVG slabs. Chip away this piece of the slab on either side of the card next to the label. Working by the label helps prevent damage to the card. Once the seam is exposed along the edge of the card, the process is identical to the PSA and BVG cards. 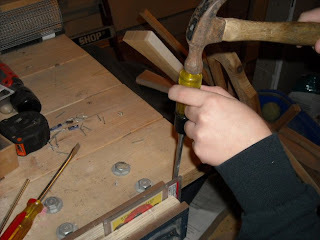 Place the slab in a vise. 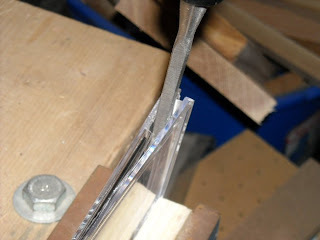 Put the chisel on the now-exposed seam next to the label, and tap it lightly with a hammer. 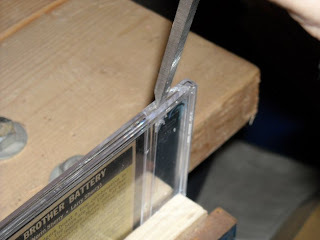 Tap the chisel into the card about a half an inch. Flip the card over and do the same to the other side. 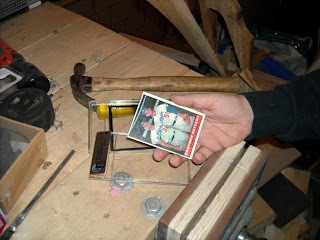 We found that we had placed the card too far down in the vise, which prevented the chisel from going very deep into the slab, so we adjusted it by loosening the vise and moving the card up, so more of the card was exposed. 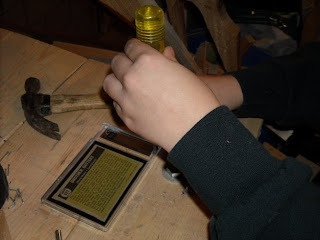 We continued to tap the chisel into the slab until the entire top of the slab came apart. At this point, the slab can be removed from the vise and simply pulled apart from the top. 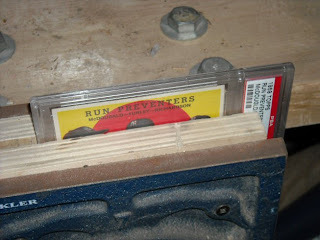 The card is loose within the slab, so be careful not to let the card fall out and onto a dirty floor or workbench. Overall, cracking open a GAI slab wasn't very difficult and took just a bit longer than the PSA card, due to the additional first step of chipping away the warp-around piece of the front part of the slab to expose the seam on the side. Again, be careful and wear eye protection, because pieces of plastic tend to fly off. 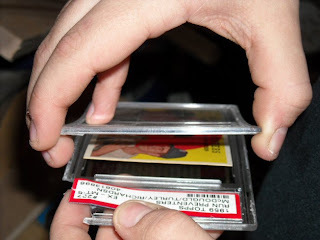 About a month ago, I described how to open a slabbed card graded by Beckett Vintage Grading. Today I'll describe how to uncrack a PSA graded card. My 11 year old son did all the work and I took the pictures. 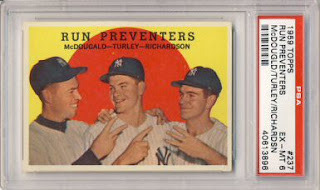 We started with a 1959 Topps Run Preventers #237, featuring Gil McDougald, Bob Turley and Bobby Richardson. I plan to get this card signed by all three of them. The PSA card was the easiest card we've cracked. It's much like the Beckett Vintage Grading slab, except the PSA slab doesn't have the inner plastic sleeve like the BVG slab. 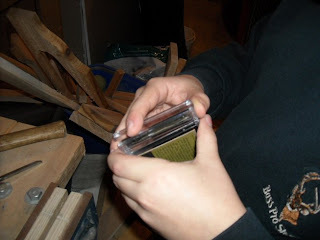 We began by placing the card on its edge in a vise. 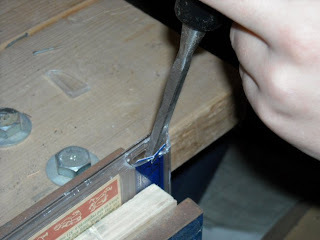 Place a narrow chisel on the seam on the edge of the card towards the top of the card, next to the PSA label. 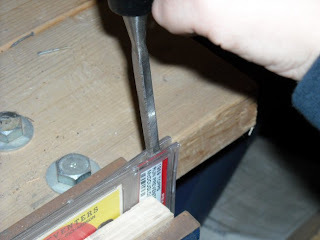 This way, if the chisel goes too far into the slab, it won't damage the card. 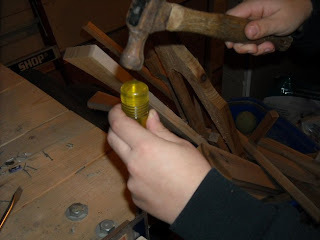 Lightly tap the top of the chisel with a hammer. 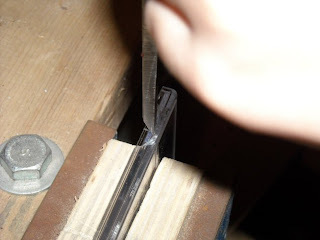 The chisel will easily break through the seam. 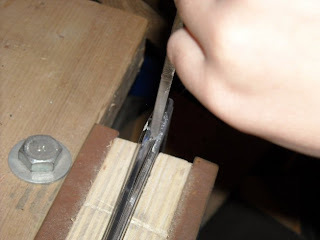 Tap the chisel lightly until it is about a half an inch into the slab. 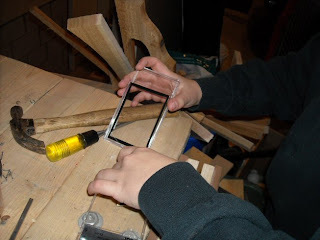 Next, flip the slab over and place it back in the vise and repeat the previous procedure. After this step, both sides of the slab next to the label will be split open. At this point, remove the slab from the vise. You should be able to simply begin pulling the slab apart from the top. 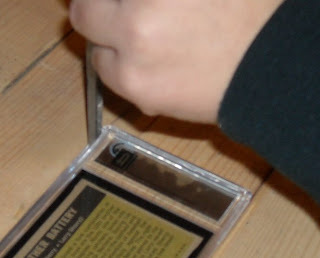 The card is pretty loose within the slab, so be careful it doesn't fall out and on to a dirty floor as you pull it apart. The whole process took less than five minutes. 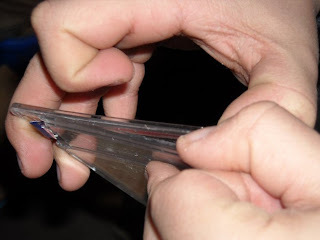 Be careful as you are breaking the plastic as small pieces can break and fly off. Wear some protective glasses to avoid injuring your eyes. Today I received a surprise in the mail. On June 3, 2008, I sent George Witt a 1961 Topps. Today I got it back, 262 days later. It was smeared a little bit, probably from him picking it up to put it back in the envelope after signing it. 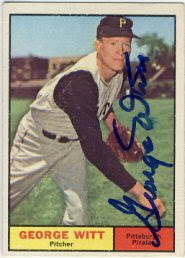 This card increases my 1961 Topps signed set to 180 cards. I'm not working too diligently on this set, but I include one of these when I send out my 1958 or 1965 set cards if the player is in both sets. I haven't paid any expensive fees to get cards signed from this set. I save that money for the '58s and '65s. I'm getting close to being done highlighting the items I got signed at TwinsFest. Maybe when I'm done, I'll start sending some more requests through the mail. 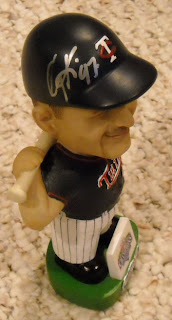 In addition to the Corey Koskie bobblehead I mentioned a couple of days ago, I was able to get three more signed from my 1987 Twins bobblehead set: Roy Smalley, Tom Kelly and Kent Hrbek. This brings the total that I have signed from this set to nine, out of 25. 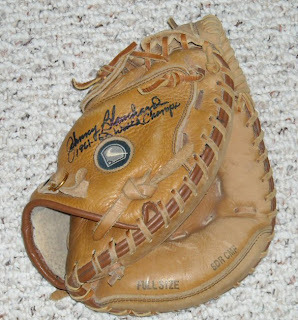 The others include Juan Berenguer, Bert Blyleven, Dan Gladden, Tim Laudner, Al Newman and Frank Viola. 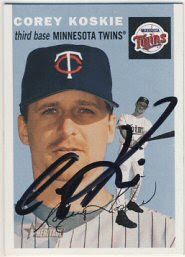 I believe there is going to be a signing in March with Gene Larkin at Tom Frantzen's Sports Collectibles in Moundsview, so hopefully I'll be able to add that one to my collection too. 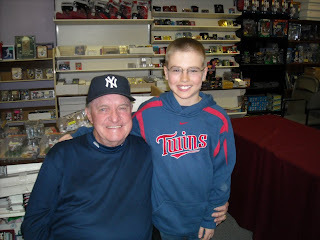 Two players from the set have passed away: Kirby Puckett and Joe Niekro. 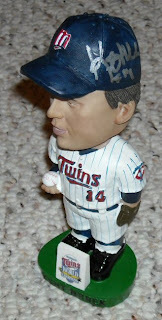 Corey Koskie was at TwinsFest this year. 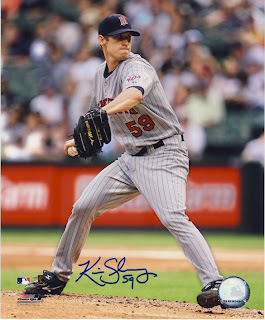 I had gotten some cards signed by him through the mail a few years ago when he was playing for the Twins, but not on his 2003 Topps Heritage. It was nice to get the chance to get a couple autographs from him, although he seemed uninterested in being there. I read an article today that said that Koskie is working out at the Minor League complex in Ft. Meyers and hopes to catch on with a team this year. He's been out since July of 2006 after suffering a concussion. 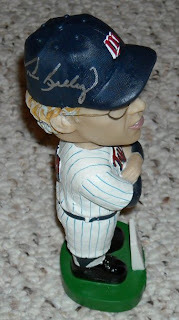 In addition to getting the 2003 Topps Heritage signed, he also signed a bobblehead for me. I went through his line twice, which also included Philip Humber. Jim "Mudcat" Grant was also supposed to be at that station, but I guess he didn't show up that day. I got a total of 15 signed pictures at TwinsFest this year. 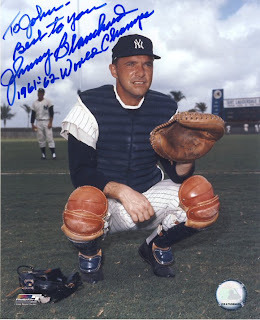 I like autographed items like 8x10s and baseball cards that have the player's pictures on them. They also take up little room to store, but take some work to display nicely. For 8x10 pictures, I buy very inexpensive black metal frames at Michael's (2 for $6) and black mats that are usually about $3.50. I have a lot of 8x10s that need to be framed and hung in the basement. I'm not sure when I'll get to that. I think I still have some signed 8x10s that I haven't framed yet from players that aren't even on the team any more. Michael's also has some nice frames that hold 20 baseball cards. I have one full of some of my 1958 Topps. I plan on filling another with the 2008 Goudeys when I get 20 of them signed. The regular price on those frames is about $40, but I only buy them with a 40-50% off coupon, which they have in the Sunday paper regularly. 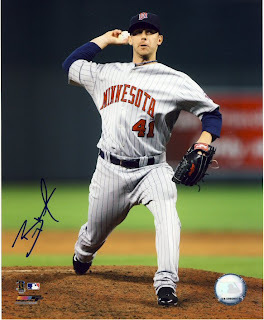 Today I scanned in all the 8x10 pictures I got signed at TwinsFest. 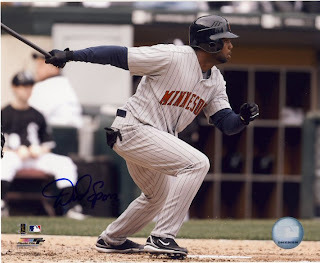 One of the pictures I got signed was Delmon Young. 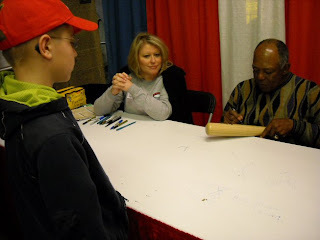 Young wasn't at TwinsFest on Friday night or all day Saturday, so when he was there on Sunday, I went through his line twice. The first time through, I had him sign the picture, and the second time through I had him sign his 2008 Goudey. I can't really decipher his signature, but I can recognize it as his now since I have several in my collection. 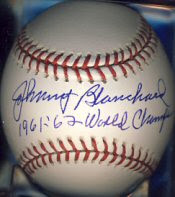 Today, Johnny and I headed out to Mounds View to meet Johnny Blanchard and get a couple of autographs. Well, five autographs. 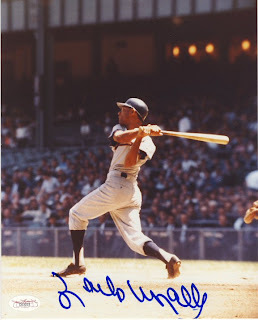 He was appearing at Tom Frantzen's Sports Collectibles and they were charging a very reasonable $8 per autograph, regardless of the item being signed. 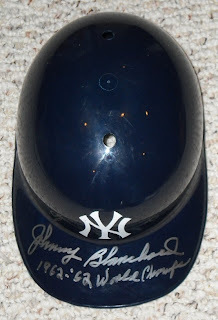 Johnny had picked up a plastic Yankees batting helmet a while ago at a flea market, so he had him sign that, his catcher's mitt, and an 8x10 we bought at the signing. After sending a couple of cards to him in the mail last November, I decided to have him sign a ball and a bat. Mr. Blanchard was full of stories. The line moved very slowly as he was very talkative, but nobody minded. We all enjoyed hearing his opinions on steroids, Commissioner Selig, and Yankee Stadium. We also really enjoyed his stories about Mickey Mantle, Roger Maris and Yogi Berra. One funny story about Yogi revolved around he, Yogi and Mickey trying to decide where to go out to eat. Mickey suggested some Italian restaurant, but Yogi warned them not to go there. "Nobody goes there anymore. It's too crowded", he said. Funny stuff. Johnny really enjoyed meeting a fellow catcher, especially one that had won two World Series. 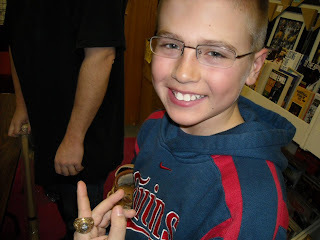 Mr. Blanchard was kind enough to let Johnny wear his World Series ring. I'm sure Johnny will remember today for a long time. 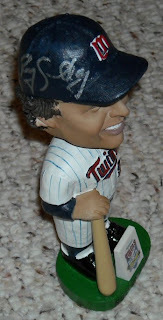 Back to adding a few more TwinsFest items today. 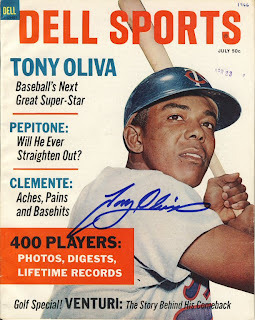 We have met Tony Oliva many times over the last few years. We have several things signed by him including balls, bobbleheads, cards, photos, bats and magazines. This year Johnny and I each got a full sized bat signed by him. Also, I got a really cool Dell Sports Magazine signed by him, and David was kind enough to get a jersey card signed for John (to help make up for the Mauer/Morneau line fiasco). Mr. Oliva is always very nice and takes his time to sign everything nicely. I still have one of those Sports Illustrated posters of him to get signed. Maybe next year. The plumber fixed the leaking water line in the basement celing today. 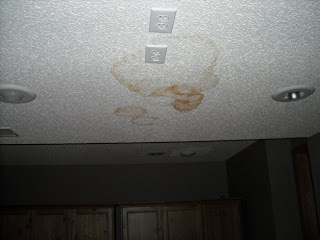 I have posted a picture here of the damaged ceiling prior to the repair. It looks similar except now there is a 5x8 inch hole in the ceiling.